At first glance, the two-lane bridge over Wapsinonoc Creek seems up to date. But a closer inspection reveals rusted bolts, graffiti and crooked beams. Over 4,000 cars travel across it each day, and it has not been reconstructed since 1956. 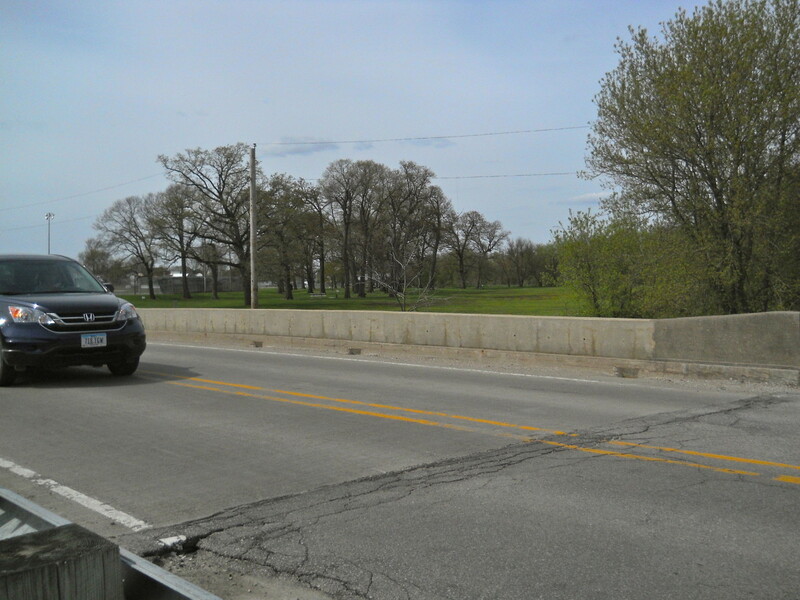 The bridge, located in Muscatine County, is one of 5,000 bridges in Iowa classified as structurally deficient, giving Iowa the third worst bridge conditions in the nation, according to a recently released report. Although the report said bridges all over America are in a sad state of repair and getting worse, Iowa’s bridge problem stands out by several measures. 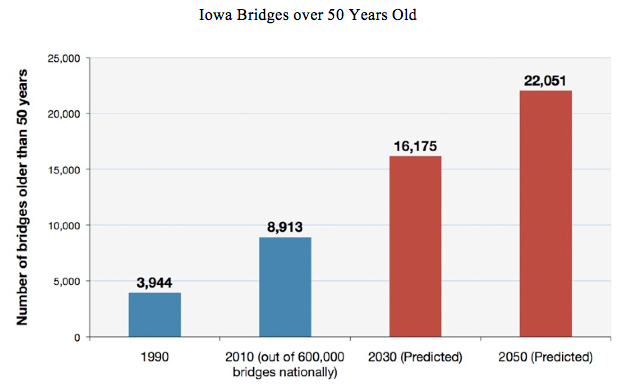 More than 40 percent of Iowa’s spans are over 50 years old, which is the normal design lifespan of a bridge. Nearly 22 percent – more than one in every five bridges – are structurally deficient, and that is almost double the national average. For comparison, the states doing the best job of keeping their bridges safe are Nevada, Florida, Texas, Arizona and Utah, where deficient bridges range from 2.2 percent to 4.5. The report, “The Fix We’re in For: The State of Our Nation’s Bridges,” released in late March, puts Pennsylvania and Oklahoma as the only states with a higher percentage of structurally deficient bridges. “The nation’s bridges are aging and traffic demands are increasing, even as state and local revenues are shrinking,” the report said. And the problem is likely to keep getting worse, because state-level needs have nearly doubled since 2006. And it warned states that deferring maintenance of bridges is not only a safety risk, but a false savings. “Deferring maintenance of bridges and highways can cost three times as much as preventive repairs,” it said. The report was released by Transportation For America, described as a group mainly concerned with maintaining the nation’s current infrastructure, according to its spokesman David Goldberg. On the list of the worst 100 counties, Iowa holds 17 of the spots, more than any other state, with Adams County being the 10th worst in the country. 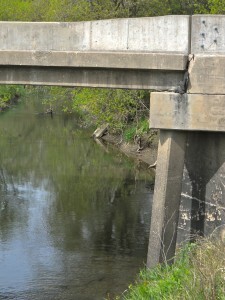 Almost 47 percent of Adams County’s bridges are structurally deficient. Winnebago, Davis, Lucas and Plymouth Counties not far behind. The counties with the safest bridges are Clinton and Jackson counties. “We try, as money permits, to keep improving them,” said Eldon Rike, the bridge engineer for Adams County. The three components of the bridge include the deck, which is the part that supports the motorists traveling across it, the superstructure, which supports the deck and the substructure, which supports the superstructure using the ground for support. When a bridge has been labeled structurally deficient it requires significant repair but does not mean a collapse is imminent. Wilfrid Nixon, a University of Iowa engineering professor, agreed and said that the structurally deficient bridges could last another 50 years. He also said that how long the bridges remain safe depends on average daily traffic, which is a large factor. 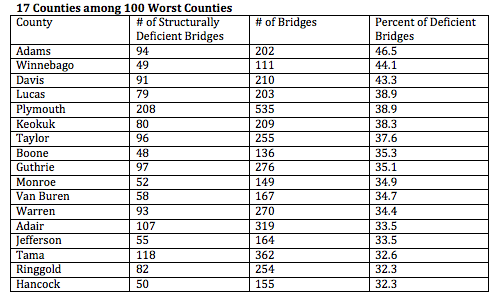 Bridges that are heavily traveled deteriorate at a faster rate than untraveled bridges, which is another area where Iowa doesn’t fare very well in comparison with the overwhelming majority of states. 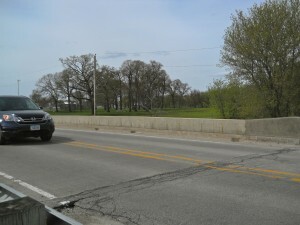 Only 16 states have a greater percentage of daily bridge traversing deficient bridges than Iowa does, the report said. 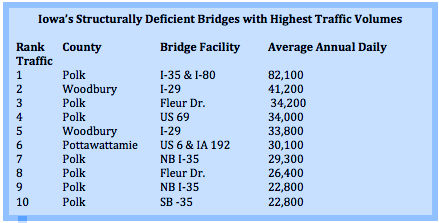 Just over 7 percent of Iowa’s daily bridge traffic occurs on structurally deficient bridges, according to the report. If these bridges do become unsafe, the bridge can either be posted to limit the weight load allowed on the bridge or shut down. Bridge shutdowns are very rare at the state, also known as the primary, level, and most bridge closings are a result of accidents, according to McDonald. He said bridge responsibility is divided. The state is responsible for about 4,100 bridges; the counties are responsible for 19,600 and cities 1,000. Because of the differences in ownership, the responsibility of repair and inspection falls into different hands. The state conducts its own inspections, while some counties hire certified engineers. The state bridges are more likely to be repaired, and the county bridges are more likely to be posted, McDonald said. Inspectors examine bridges every two years, with a number of the busier bridges getting annual inspections, as do most structurally deficient bridges. These inspections determine whether to close or post a structurally deficient bridges. Inspection results are kept in the Structure Inventory and Inspection Management System database, which any Iowa citizen can access for free by registering for an account. The database keeps track of all inspections and sends out notifications if a bridge misses its deadline for inspection, according to Nicole Fox, a secondary roads engineer for the Iowa Department of Transportation. McDonald also said that Iowa is fifth in the nation for the number of bridges, which is a reason for the large number of structurally deficient bridges, since every bridge will eventually age and deteriorate. But, there are other states with more bridges than Iowa that still find ways to do a better job at keeping bridges repaired. Five other states either have more bridges or just a few fewer than Iowa, but have a much lower percentage of structurally deficient bridges. Repairing Iowa’s structurally deficient bridges would be an enormous, expensive task, and a lack of funding also contributes to the high number. McDonald estimated that it would cost around $2.5 billion to repair all of Iowa’s structurally deficient bridges. Nationwide, the Federal Highway Administration estimates $70.9 billion would be needed to address all deficient bridges. The Iowa Department of Transportation, which is responsible for the primary bridge system, receives money from the Federal Highway Administration, which distributes it among the state, counties and cities, Gary Novey, an assistant bridge engineer, said. They also receive money to distribute from fuel taxes and vehicle registration fees, which makes up the Road Use Tax Fund. Federal funding from the federal fuel tax for transportation has not been raised since 1993, and the state fuel tax rate has not been raised since 1989. The rising costs of construction paired with stagnant funding has left the state and counties unable to keep up with bridge repair, according to Fox, the secondary roads engineer for Iowa. The department uses about 20 percent of its revenue on bridges, but when it comes to counties the number varies, according to Novey. Counties receive money from the state based on the square foot of deficient bridges, among other factors including total miles of roads, according to Fox. She said that while there is no state enforcement on when a bridge has to be repaired, the enforcement at the country level comes from the Board of Supervisors. They regulate transportation funds and decide whether to repair, post or close down bridges. The only regulation comes from the National Bridge Inspection Standards, which regulates bridge inspections, not bridge repairs. Fox, the state secondary roads engineer, said there is not a specific formula to determine if a bridge is unsafe. If a structurally deficient bridge is not repaired and its condition worsens, then the bridge is usually posted to limit the weight allowed. If the condition continues to worsen, the posted weight is lowered. Bridges are usually closed when they are posted at three tons and receive a lower rating at their next inspection, according to Fox. A $50 million Bridge Safety Fund was approved in 2010 to repair “functionally obsolete and structurally deficient bridges” on the primary highway system. The Bridge Safety Fund allowed 31 bridges to begin to be repaired in 2010 and 18 are scheduled to be repaired in 2011. So far, 17 have been completed. But that compared to the large number of structurally deficient bridges throughout the state, leads to other proposals to give the department more revenue to work with. Tjepkes says he supports an increase in fuel taxes to help repair Iowa’s bridges. He says he supports this because it charges the people who are causing the “wear and tear” on the roads and bridges. Fox said that more funding would likely come from an increased gas tax. She said the tax could be mileage based, because of the recent rise of electric cars, which would pay less because they consume little or no fuel. She also pointed out that for the county level Board of Supervisors, it is hard to raise taxes and transferring funds often upsets people. The politics of reelection restrains them from increasing funding for transportation. Gov. Branstad created the Transportation 2020 Citizen Advisory Commission in March that will holdmeetings throughout the state to listen to citizen’s concerns and work with the Iowa Department of Transportation to develop a plan to address transportation needs. McDonald said the Department of Transportation plans on working with congress and the Iowa legislature to try and secure more funding. (Margaret Murphy is a journalism student, double majoring in political science, at the University of Iowa). “Own your own victory garden and four room house,” a Davenport realtor suggested to buyers in a local newspaper ad in spring 1942. All over the state businesses used the victory garden campaign to sell their products and services. The report is interesting, however it does not warrant the scare factor that The Gazzette has dreamed up by placing this article on the front page. Or, perhaps, this was just a slow news day. While I think that most anyone would agree that Iowa bridges may need to be a higher priority than they currently seem to be, I think that, based on the article presented that perhaps the method used to inspect the bridges also needs an upgrade. The statment made that even those bridges that have structural issues could still remain safe for the next 50 years means that one should not judge that a bridge needs to be replaced on that criteria alone. Perhaps additional factors, such as amount of traffic, should help to better determine if/when a bridge should be placed at a higher priority. About the article itself, the first paragraph needs some help. I would have eliminated “graffiti” from the article as just because a bridge has a good paint job doen’t have much to do with how safe a bridge is.